If you have always wanted to learn to crochet, we will be starting right from the beginning - you will learn the basics & how to work a granny square which can be turned into a hat or finger-less gloves. Materials will be provided - 100g Chunky Yorkshire spun yarn, (choice of colour), crochet hook & beginners instructions. You will learn Casting on, Casting Off, & simple shaping, & how to read a simple pattern to make a pair of Easy Fingerless Gloves. Materials will be provided - 100g Chunky Yorkshire spun yarn (choice of colour), knitting needles & beginner's instructions. 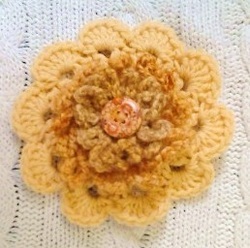 Learn further crochet techniques - working in the round, & how to make various flowers & brooches. I am also able to give One to One tuition on the Knitting Machine, so if you have one under the bed, in the loft or wherever it has been hidden away, I can help you to get it knitting again! "Just wanted to say thanks very much for the classes this week! We found it very useful and the notes are so easy to understand . I've finished my hat so will send you pictures soon! Cara is nearly finished sewing hers. Will definitely recommend you to people at our university. Thanks again, Amy and Cara."